The Austrian botanical illustrator Franz Bauer came from a family of gifted artists (HERE). Franz spent nearly 50 years at Kew gardens as a botanical artist (HERE). Bauer was also one of the most keen eyed observers of his day. He used a range of microscopes and developed his own observation techniques. For example in November 1836 he wrote a letter to Andrew Pritchard describing his method for making accurate microscopic drawings. 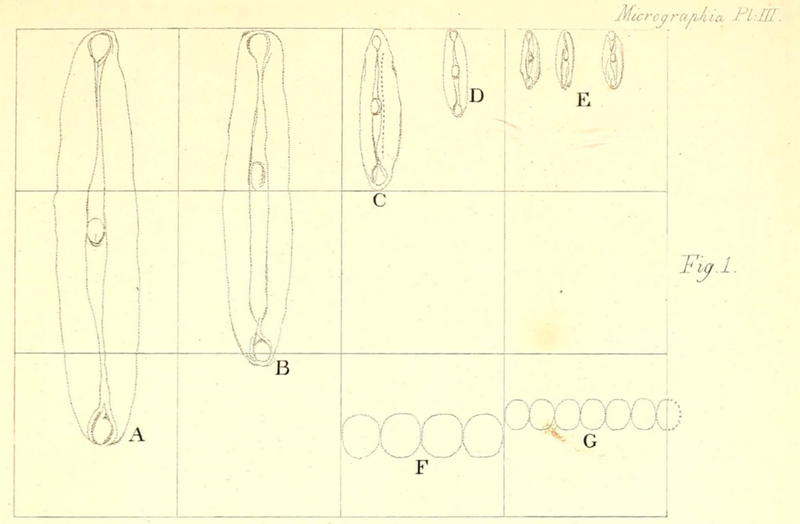 This letter was published in 1837 as an Appendix to Micrographia by C.R. Goring & Andrew Pritchard (HERE). 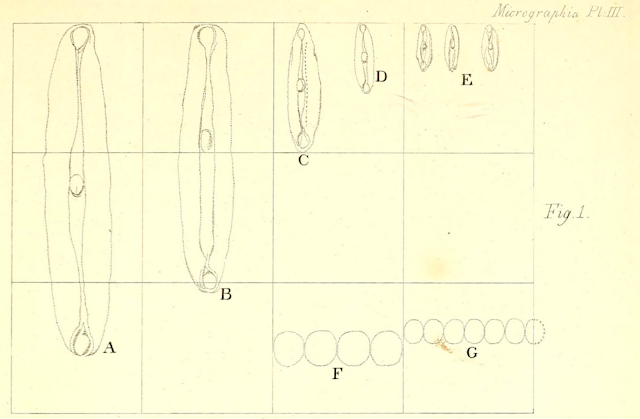 The Appendix written by Franz Bauer is entitled "On making drawings of microscopic subjects". Bauer used two ruled glass micrometers (or graticules) both ruled into squares that were 1/40th inch on their sides. One of the graticules was placed in the eyepiece and the other on the stage. The magnification of the microscope was then adjusted until an integral number of the eyepiece divisions fit into a single division of the stage graticule. This meant he could calculate magnification. He could then leave the maicroscope set up and remove the stage graticule. When he now drew what he saw on paper he first drew a sguare grid of one inch squares. Thus he could accurately record on paper the magnification of the object. One of his figures is shown. A is 2 1/2 400ths of an inch long and 1/900th inch wide. "The globular fungi at F are 1-1600th part of an inch in diameter, and the very minute globules of blood at G are each about 1-2400th or 1-2500th part of an inch in diameter." Note that 1/2500th of an inch is about 10 microns. Red blood cells are 6-8 microns in diameter.